"The farmer dies feeding this country, but no one fights for the farmer," says a woman whose son, a farmer, died by suicide. He was $40,000 in debt. Her husband died of a heart attack days later. Onion farmer Sanjay Sathe was so disappointed with how little he made from his recent harvest that he decided to pull a stunt: He sent a money order for his entire profit — a paltry $15 — to Prime Minister Narendra Modi, who's running for re-election this spring. Sathe wanted to show him the meager earnings that Indian farmers must live on. Sathe, 44, grows onions on about an acre of land along a roadside in a rural part of Maharashtra state about 130 miles from Mumbai. This little farm prospered under Sathe's grandfather and father. But now the family has a side gig raising goats because the price of onions keeps falling. From a good harvest, Sathe says he can earn the equivalent of about $350. That has to last his family half a year. But his autumn crop yield was poor, and what he could sell it for was even worse: just 2 cents per kilo, amounting to that paltry $15. Sathe and fellow farmers increasingly blame the government. They've taken to the streets across India in recent months, staging giant protests and marches and demanding that Modi forgive their debts and fix higher prices for produce. The Indian government sets minimum prices for many commodities, but farmers often have to take out loans from state banks and private lenders to make ends meet. About half of Indians work in agriculture, and two-thirds live in rural areas. They will be a powerful voting bloc in the upcoming election, which is expected by May. "The government neglects farmers. It gives tax breaks to big business and plays up controversies over Hindu temples and such — all for votes," Sathe says. "But look at us! We're dying here." He's not exaggerating. A suicide epidemic has claimed the lives of tens of thousands of Indian farmers over the past two decades as food prices drop and pesticides and fertilizers get more expensive. Maharashtra, which also suffers frequent droughts, has been called the epicenter of the crisis, with more than 20,000 farmer suicides from 2001 to 2017. Low food prices keep India's poor from starving. But for farmers, it means low profits. Modi's government has been cautious about meeting farmers' demands for higher food prices, though it recently earmarked in its interim budget a guaranteed income of 6,000 rupees (about $84) annually for each Indian farmer. The opposition Congress party has also offered a universal basic income to all of India's poor as part of its own election campaign. "Farmers want higher prices. Consumers want lower prices. So there is enormous opposition to the idea of increasing the minimum support prices for farmers, because it is argued that it will lead to inflation," says economist R. Ramakumar of the Tata Institute of Social Sciences in Mumbai. In the case of onions, there's no minimum price — so it's particularly volatile. It got even worse for farmers a little over two years ago, when agriculture, which runs almost solely on cash, was inadvertently hurt by a new government policy designed to fight corruption. It was one of Modi's signature policies: demonetization. In November 2016, the Indian government invalidated most of the country's paper money, especially bills of big denominations. Indians had to deposit their cash into banks or at least exchange their old bills for new ones. The idea was to incentivize the use of digital banking and hurt the black market economy. "They pulled out all the 500-rupee notes and 1,000-rupee notes that were in circulation. So traders did not have cash to buy these products of farmers," Ramakumar says. "That's why a lot of farmers actually dumped onions on the road, in protest." That was in late 2016. In late December 2018, the price of onions in Maharashtra dropped more than 80 percent because of a surplus and fewer exports. Maharashtra is India's biggest onion producer and home to the country's largest wholesale onion market. On a visit to a nearby wholesale onion market in January, NPR found rows upon rows of flatbed trucks overflowing with onions that were rotting in the sun. Refusing to sell at a loss, farmers were waiting for higher prices — which never materialized. When their onions rotted, they became worthless. 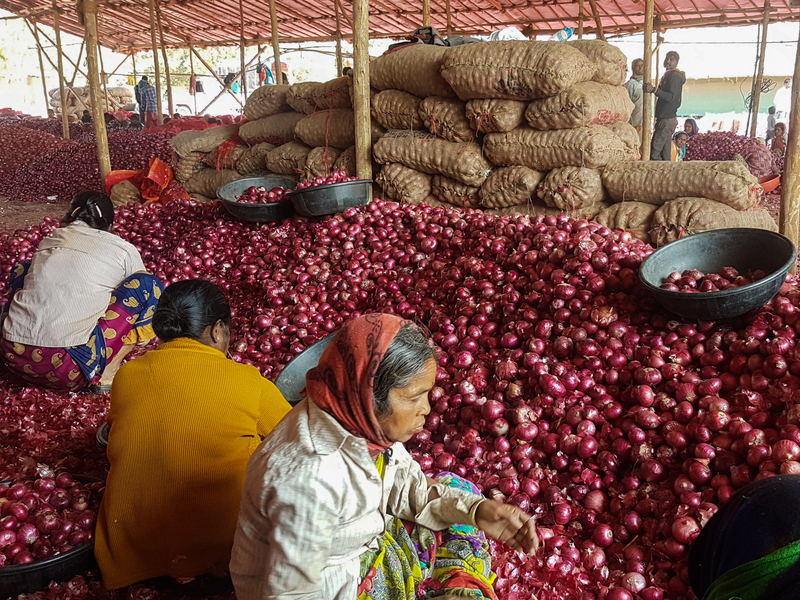 "At this rate, I can't even afford to rent the truck to haul my onions over here," said farmer Vijay Ghayal, 43, the dejected owner of one truckload of onions. "We are all in the same situation." Dozens of farmers shook their heads in agreement. Meanwhile, the money order of fellow onion farmer Sathe was returned by the prime minister's office. Sathe also got some somber news from his neighbors: Two onion growers in his area of Maharashtra had killed themselves. One of them, Vitthal Jadhav, had been about $40,000 in debt. He drank pesticide to end his life in late November. His brother found his body the next day. "My son was the only educated one in our family," says Jadhav's mother, Irabai Jadhav, 60, sitting cross-legged on the cement floor of her family house and weeping. "He's the only one who understood the loan documents. I'm worried about how I'll feed his children." In early December, her husband, also a farmer, died of a heart attack 12 days after her son's death. "I rue the day we ever became farmers," she says. "The farmer dies feeding this country, but no one fights for the farmer." With elections coming, political parties in India are fighting for farmers' votes, offering to forgive debt owed to state banks. But many loans to farmers come from private sources — banks, moneylenders, relatives and others — and are predatory. Interest rates average around 40 percent, according to economist Ramakumar. In India, people say onion prices can sway elections. In the past, voters pushed back when prices were too high. This time, the family members of widow Irabai Jadhav say whoever helps them will receive their votes.